Smart phones carry loads of personal and sensitive information ranging from passwords to contacts to banking information and corporate mail. 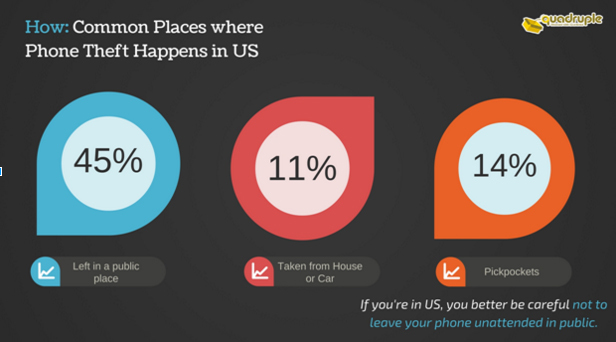 Surveys have been taken across some of the respondents in U.S., U.K., France and Germany about the exceeding phone thefts and some of the highlights have been documented in order to create public awareness. People become careless of their phones while they travel. The majority of thefts happen because the individuals leave their phone behind accidentally which is later snatched by a burglar. Europeans are the most victims of pickpocketing compared to Americans roughly 28% in Europe versus 11% in the U.S. 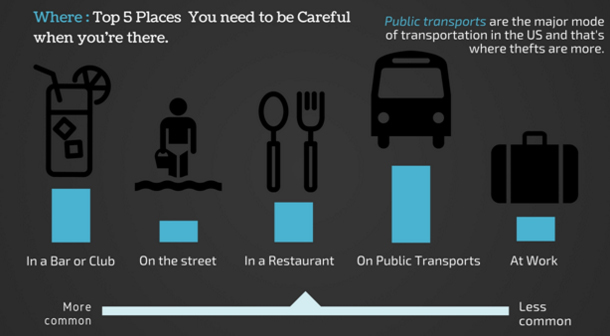 In America, public commuters are the most common mode of transport. It is shocking to know that most phone thefts happen in restaurants, bar & nightclubs and public transports. Americans are forgetful people. In an urban environment, individuals get busy with work during the peak hours of the day and that’s also the prime time where phones are getting snatched from the victims. 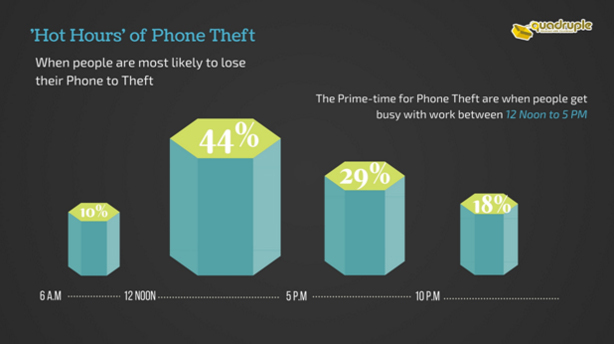 It is during the midday between 12 noon to 5 pm when careless Smartphone owners fall prey to phone theft. People fail to notice their being lost immediately. By immediately we mean within an hour. 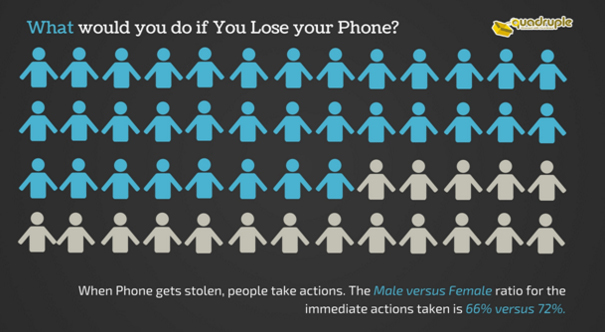 Only 25 percent of victims in America tend to notice that their phone has been stolen immediately. The chances of discovering your missing phone back is agreeable though we need to accept the fact that thieves are sneaky and they might do anything to avoid being tracked. Removing the SIM card from the device is one way of doing it or turning the device into airplane mode to avoid any contacts. Whilst 90 percent of victims are ready to go for drastic measures to retrieve their Smartphone, only 32 percent of the victims have actually succeeded in it. While some of the data stored in the device can be recovered, some cannot be, such as passwords, videos, apps and the data it contains. This might result in several emotional effects on the victims ranged from stress to depression. Adverse and worst case scenarios include identity theft or fraudulent fund transfer in accounts. 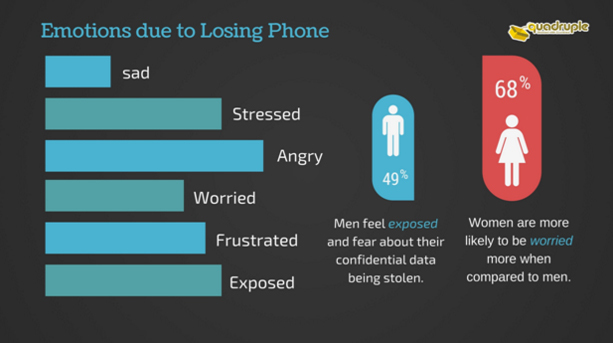 70% victims research on security features while purchase of new Smartphone. 76% victims download Anti Theft Apps. 80% victims set PIN lock or passcode to prevent intruders. Remember, its not just a mobile device but the repository of all your sensitive & confidential personal and official information. Sensitive info stored is INVALUABLE & in wrong hands can cause huge losses and embarrassment. Be Aware. Be attentive to your surroundings specially when you are in public place or charging your mobile device in public place. Take good care of your smartphone the way in which you take care of your wallet. Do not text and walk, or talk and walk or having an eye when its getting charged in public place. Use Security lock, or PIN feature. The passwords which you use should be hard enough to guess. Change it on a regular basis. Backup. Take the backup of all the information and data stored. Insure It. Just in case, if it is lost or stolen, your replacement device is covered. Add Apps. Use the Anti Theft Mobile Apps to ensure that not only you get your device back, but the culprits have no zero access to your confidential and sensitive folders and information. Q Anti theft Alarm Pro is designed to prevent your mobile from theft attempts. Just $1 for life time. No Annual Subscription.